The third of Madrid's famed art galleries, the Reina Sofia is dedicated to 20th century Spanish art, having been designed to give Spain a museum to equal France's Pompidou Centre and London's Tate Gallery. The museum was opened by Queen Sofia in 1986, and is housed in the former Hospital de San Carlos. The artworks displayed here include those of Spanish masters Juan Gris, Julio Gonzalez, Salvador Dali, Equipo Cronica, Gerardo Rueda, Joan Miro and Pablo Picasso, among others, and there are also international artists on display. 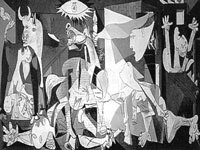 The star attraction of the museum is Picasso's controversial Guernica, depicting the Nazi bombing of the Basque town in 1937 in support of Franco's cause in the Spanish Civil War. Until 1980 this famous painting hung in New York's Museum of Modern Art; for many art lovers this one piece justifies a visit. The top floor of the museum is a library dedicated to art, and there is a bookshop and a cafeteria. There is also outdoor sculpture garden, which is pleasant to stroll through. The museum is immensely popular, especially when there are high-profile temporary exhibits, and the queues can get very long making it well worth booking your tickets in advance online. Opening times: Monday, Wednesday, Thursday, Friday, Saturday 10am to 9pm; Sunday 10am to 2.30pm and limited exhibitions open between 2.30pm and 7pm; closed Tuesdays. Admission: €8 (general); €4 (temporary exhibitions); concessions available.